Presented by: Alison Schlyen, Reference Librarian for the Broward County Main Library in Fort Lauderdale for the past 15 years. She specializes in genealogy research and has done other presentations about Ancestry.com, How to find your Military Records, Genealogy and Government Records, Immigration and Caribbean Genealogy. There will be two drawings at the Regular Meeting for members only. the other is a 50/50 drawing (tickets $1.00 or 6 for $5.00). Parking $1.00/hour - first floor of parking garage. We hope to continue to develop new and interesting areas for you to search for your family history. family history or research. Feel free to let us know your thoughts and share your ideas. Consider becoming a member to enhance your research and help others along the way. 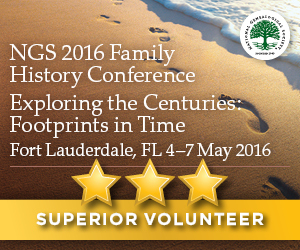 Click here to find us at Genealogical Society of Broward County and like us.